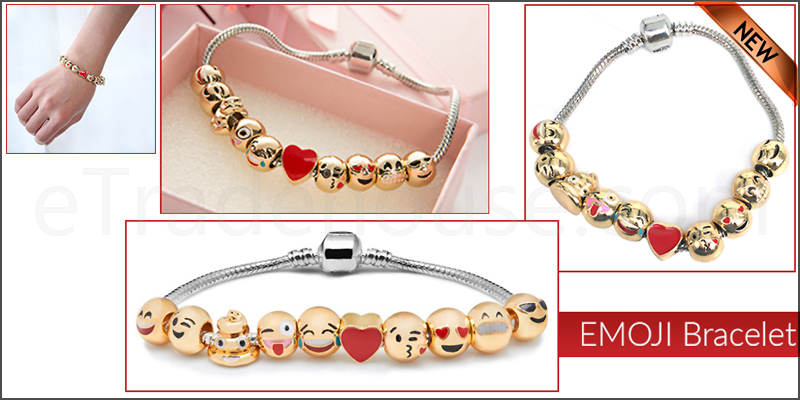 18k Gold Plated 3D emoji fun face charms bracelet. Beautiful high quality bead bracelet suitable for wearing it on get-together and functions etc. Wear the individual beauty of fun face charms. New good Quality innovative Design bracelet. Gift it to your friends and fellows to make them smile. Bracelet with 18K yellow gold plated beads. Bracelet with 10x Fun Face Characters. Bracelet for casual and formal both. Goes with every look, can be carried on fun parties, school parties and have some fun!! Material: 18K Gold Plated Chain + Beads. 1x 18k Gold plated 3D Emoji fun face charms bracelet.